Certified business coaches and Alex Cora of the Red Sox. Wait What Really OK Podcast Episode 96 hosted by Branding Strategist and Red Sox fan, Loren Weisman. This is not just about baseball in this episode, but more of a lead in about how so many seem in shock and awe of the rookie coach who helped to get his team to win 108 games in the regular season and then lead them to win the world series. While it was Alex Cora’s first year as the manager and coach, his experience, his knowledge, ... See More his authority and his authenticity shines in all that he has done and everywhere he has been at every step. Now on the other side of the coin, would you want some manager or coach to help you that had never played the game and took a simple course with a fly by night certification? Probably not. Now bring this into the business realm. Would you want a certified business coach that knows nothing or is very limited on their business knowledge, telling you what to do? Think about the people you want in and around you as well as the types you think are best to listen to, pay and learn from. 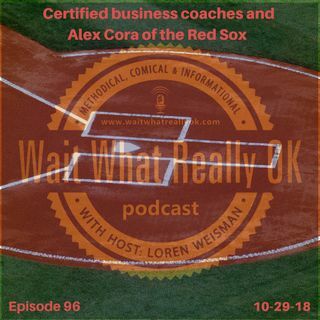 Episode 96 of the brand strategy podcast Wait What Really OK is called Certified business coaches and Alex Cora of the Red Sox. The show is available on iHeartRadio. “News and Information Podcast Percussion Outro” by Doug Hinrichs. Copyright 2016 Dig And Be Dug Music (BMI).